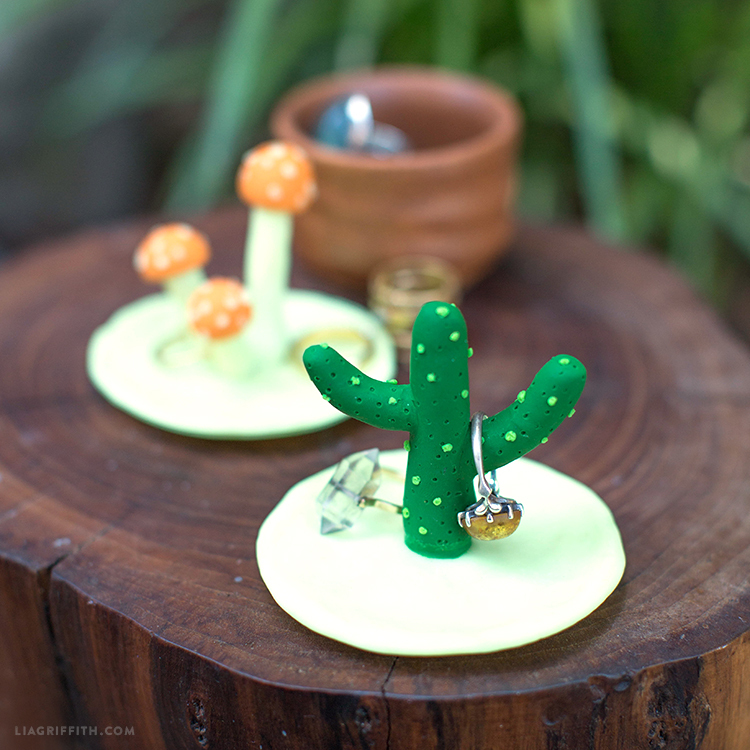 Make This Incredibly Cute DIY Clay Cactus Ring Holder! Cacti + Cactyou = Cactus! Nothing says love quite like a prickly plant. 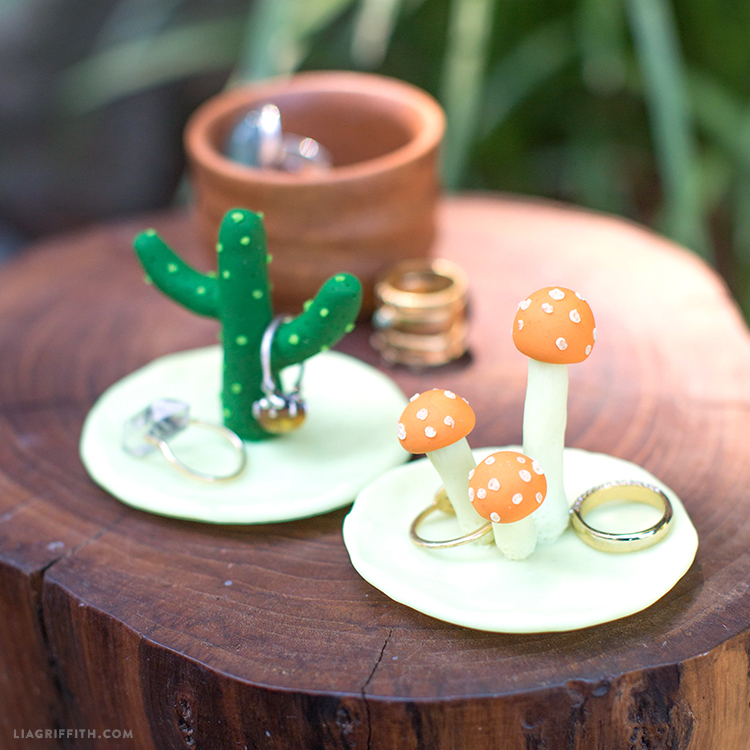 Hang your wedding bands in style with this super adorable clay cactus (or mushroom) ring holder! This project is cute, quick, and – best of all – really easy to make. 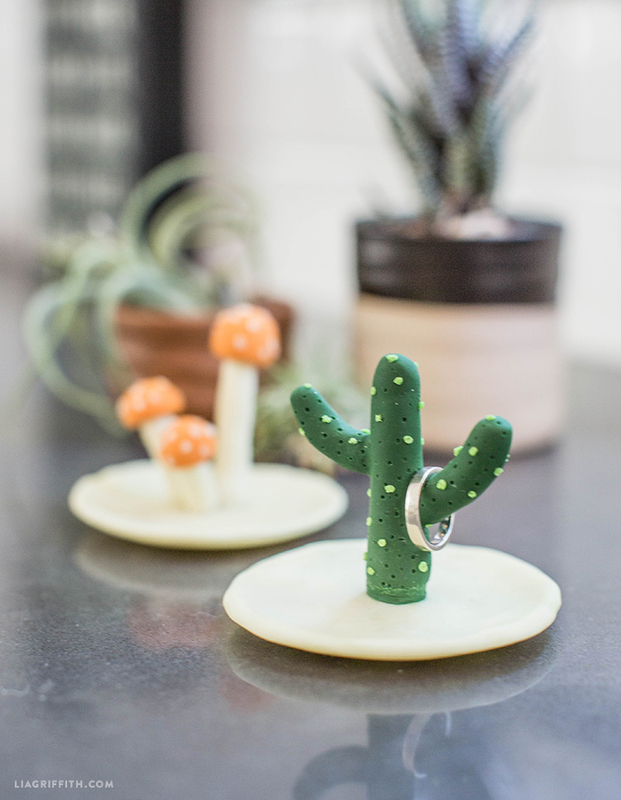 For a unique craft that can keep your rings sticking together, look no further than this tiny cactus. 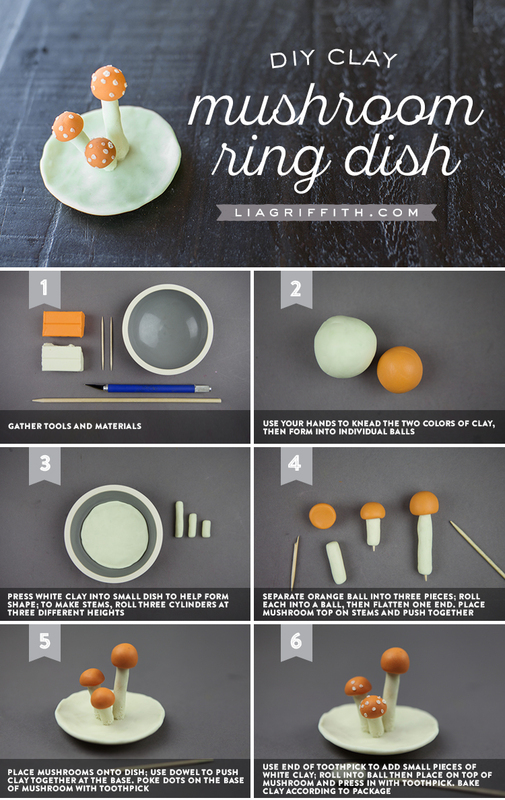 Use your hands to knead all three colors of clay, then form into individual balls. Press white clay into small dish to help form shape. Separate green clay into 3 pieces, one large and two small. Roll clay into cylinders. Attach small pieces on the sides of large piece. Use end of a toothpick or dowel to connect and smooth out where it connects. Put half a toothpick in the bottom of cactus and stick in the center of white dish. 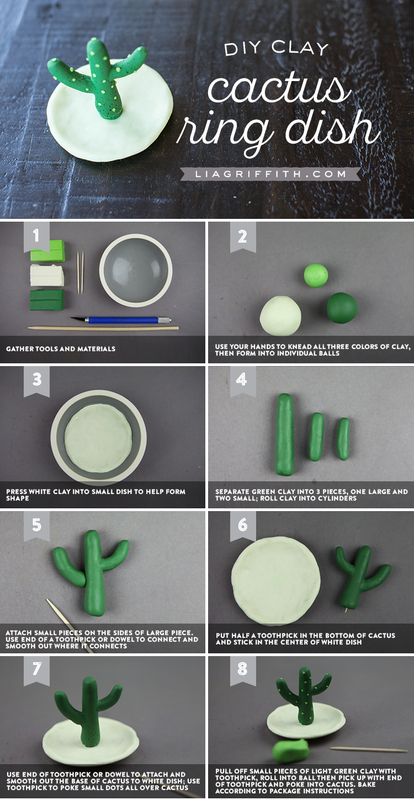 Use end of toothpick or dowel to attach and smooth out the base of cactus to white dish. Use toothpick to poke small dots all over cactus. Pull offsmall pieces of light green clay with toothpick, roll into ball then pick up with end of toothpick and poke into cactus. Bake according to package instructions. 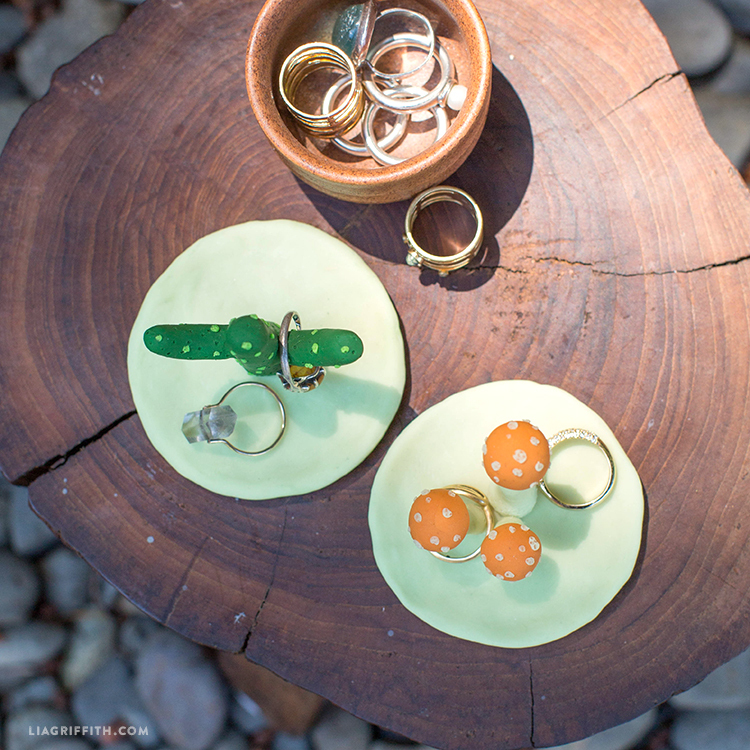 Use your hands to knead the two colors of clay, then form into individual balls. Press white clay into small dish to help form shape. To make stems, roll three cylinders at three different heights. Separate orange ball into three pieces. Roll each into a ball, then flatten one end. Place mushroom top on stems and push together using dowel. Cut toothpick to size, and push through stem to top of mushroom cap, leaving a bit sticking out of bottom. Place mushrooms onto dish. Use dowel to push clay together at the base. Poke dots on the base of mushroom with toothpick. 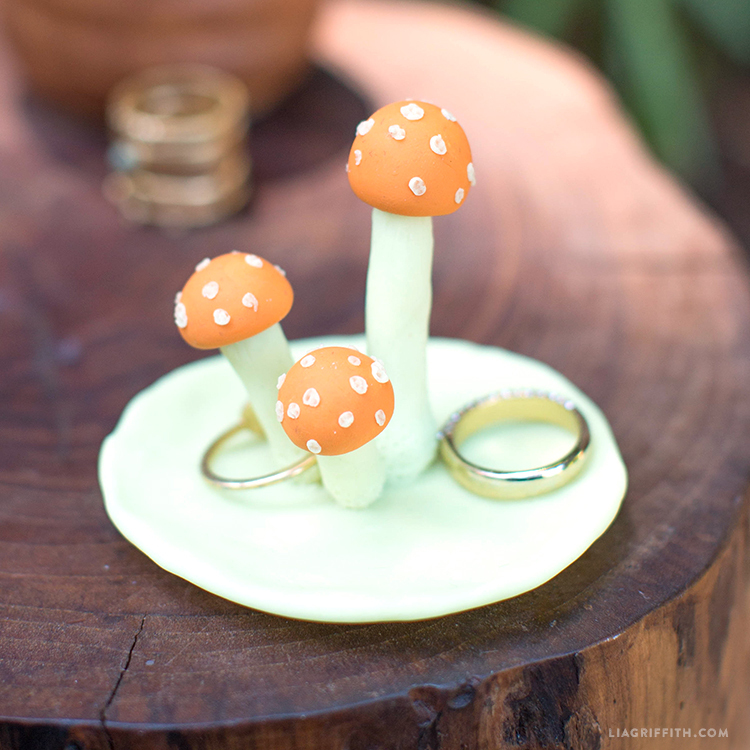 Use end of toothpick or dowel to pull off small pieces of white clay; roll into ball then place on top of mushroom and press in with toothpick. Bake according to instructions on packaging.